“Ho, everyone who thirsteth, come ye to the waters,” (Isaiah 55:1). As thirsty people gathered at a spring which furnished refreshment, they heard preachers speak of “the living water that wells up into eternal life”. (John 4:13-14) Thus, at a spring, New Hope Presbyterian Church became a place of worship long before a building was constructed. The church, a daughter of Bethel Presbyterian Church, watered the New Hope community as the spring watered the area. The earliest church records have been lost. Sessional records from the first book date back prior to 1810. An outline of events from other sources suggests the formal organization of worshipers into a Presbyterian congregation took place in 1793, according to the Reverend Samuel Lytle Watson. The Reverend Humphrey Hunter, who had been a Revolutionary War hero, would become the first part time minister. For the next 100 years, New Hope would continue to share a minister with one or more churches. Sometime during the early years of the 19th century, a crude log building was erected. A frame building was constructed in 1858 and survived the Civil War era. With further additions and improvements, the building continued to be in use, and the present building was dedicated on September 5, 1965. 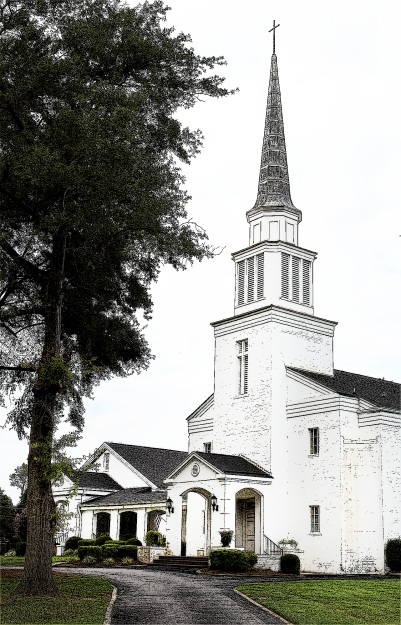 Around the turn of the century, New Hope called its first full time minister, the Reverend Joel Taylor Wade Jr. and built a manse, a six room frame house. By the late twenties, a single lane of New Hope Road was paved and cars began to replace wagons and horse drawn buggies. Members gathered around two “pot-bellied” stoves to worship and sing hymns and the pump organ was played. At this time, it was customary for men and women to sit on opposite sides of the church. Electric lights soon became a reality and a piano replaced the old pump organ. During the Great Depression, a hot-air furnace was installed and other improvements made. The New Hope Grade School, constructed in 1921 but no longer in use, was moved across New Hope Road and became the church’s educational wing, dedicated in 1952. Treasuring the heritage, an archives chapel was completed and was featured as part of the 175th anniversary. Furnishings date back to 1796. Our Church has planted itself in this community. As we move into the third century of church history, recognizing God’s daily blessings and unconditional love, the fields continue to be ready for harvest.